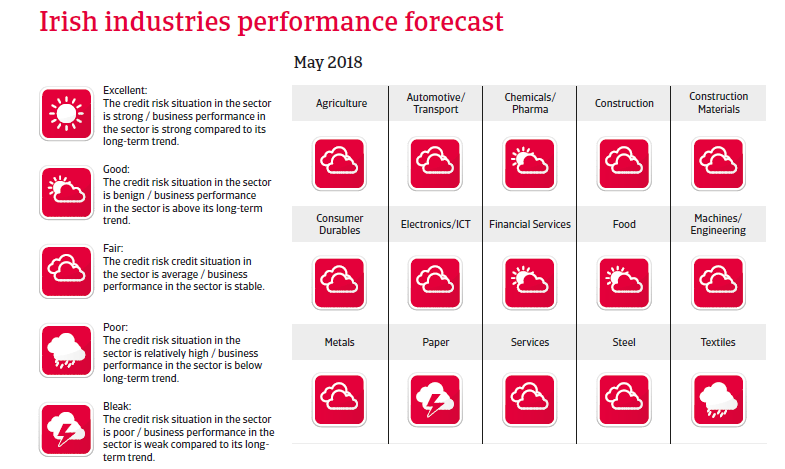 The Irish economy is expected to grow by about 4% in 2018, but remains exposed to ongoing economic uncertainties stemming from the Brexit decision. 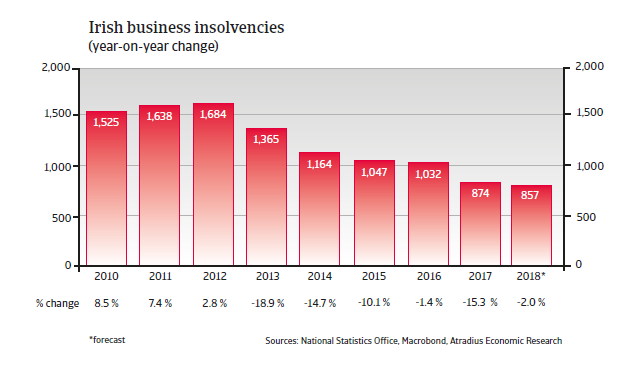 After six years of increases, Irish business insolvencies finally started to decline in 2013, and in 2017 business failures decreased 15%. However, this positive trend is expected to slow down in 2018, forecast to see a decrease of 2%. The Irish economy grew robustly in 2017, based on solid domestic demand and export growth. In 2018 and 2019 GDP expansion is expected to continue, although at a slower pace (up 4.0% and 3.1% respectively). However, economic prospects are more uncertain than in the past. As the British market accounts for about 15% of Irish goods and 20% of services exports, a potential economic downturn in the UK and the outcome of the on-going EU-UK negotiations (towards a “soft leave” or “hard leave”) will in any case affect Ireland´s economic performance. Another issue is the high indebtedness of some households and businesses. Non-performing loans account for about 13% of outstanding loans, impairing the Irish banking system and leading to a more restrictive loan policy (especially for SMEs). The high indebtedness makes the economy vulnerable to faster than expected interest increases by the European Central Bank. Due to past fiscal austerity, the budget deficit has diminished and public debt, while still high, has decreased. One year after the UK vote to leave the EU, cracks are beginning to show in the economy. This Atradius report offers an update on the current situation and insolvency outlook.